This summer, the Nature Net team (Brenna, Betsy, and I) decided that we would like to take some time to highlight all of the wonderful things our member sites do to promote environmental education and to share many of the exciting programs and events offered to families like you. With 16 member sites, it is often difficult to keep up with all that each site has to offer, they’re doing so many incredible things! My goal is to visit each of our member sites throughout the summer months so I can get a better idea of what opportunities exist for families at each site. I will be posting “Nature Net Site Spotlight” blog posts throughout the rest of the summer. I hope that you and your family will find this helpful in planning activities for the summer months and beyond. We started off learning about rocks and minerals. 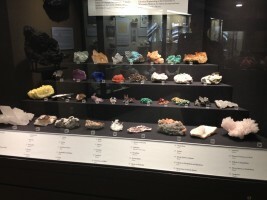 When you first enter the museum, there is a large display of minerals from all around the world. We spent some time looking at this very unique looking mineral collection, before moving on to learn a little more about rocks. Our tour guide explained some of the differences between sedimentary, metamorphic, and igneous rocks. The middle school students were more knowledgeable than me; I needed a refresher! We then moved on to the exhibit with fluorescent minerals and fossils. As the guide turned the black-light on, one student exclaimed, “What?! They Glow?!”. It was very cool to see how eager and excited these students were to be learning about rocks and minerals. Later on, we moved to the exhibit which features fossils of various dinosaurs and even a mastodon. The exhibit features fossils of a Tyrannosaurus Rex, Hadrosaur (duck-billed dinosaur), Triceratops, a Glyptodon (pictured on right), and more. 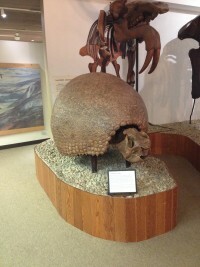 A few of the students were very excited about the Glyptodon; “Hey, that one is in the Ice Age movie!” The middle schoolers loved seeing these large and impressive fossils, some from species which lived tens of millions of years ago. I would highly recommend visiting the museum and reading about some of the fossils on display. The history of these fossils is very interesting. The mastodon, for example, is actually a composite of two mastodons. The mastodon was thought to be composed mainly of fossils found at Boaz, giving it the title “1915 Boaz Mastodon”. Recently, it was discovered that much of the skeleton is actually composed of fossils found at Anderson Mills. The UW Geology Museum has exhibits for everyone. My tour was aimed at a middle school aged group, but tours are customized to every age and knowledge level. 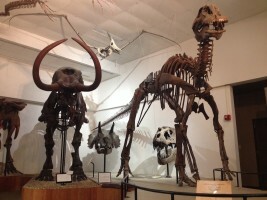 Below, I outline some of the programs and events offered by the UW Geology Museum. Group Tours: For groups of any age, tours are available for groups of 8 people or more, $2 per person. Perfect for families with little ones! 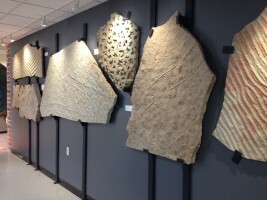 For more information, please visit the UW Geology Museum’s website here! This entry was posted in News and tagged uw geology museum. Bookmark the permalink.